The P99 series is not mentioned often in the USA today, but fifteen years ago it was a pretty big deal, at least in some circles. Finally, Walther was releasing a truly 'modern' service sidearm at an affordable price. During the '70s and '80s Walther tried several times to regain both police and military contracts, with a wide offering of different models of pistols. However, all were essentially updated Older Walther designs. For example the PP Super was nothing more than a slightly scaled up PP firing a cartridge slightly more powerful than 9mm Short (.380). Likewise, the P4 was nothing more than a P1 with a decocker only safety, firing pin block, and a shorter barrel. The P5 looked like a new design from the outside, but it was internally very similar to the WWII P38. The P88 was really the companies only 'new' design and it failed. The P88 did not fail because it was a poor pistol, but because it was just too costly to manufacture and thus had an insanely high price-tag for that era. It was Walther's last effort at an all-metal traditional style handgun, though some of its features were later carried over to later designs. 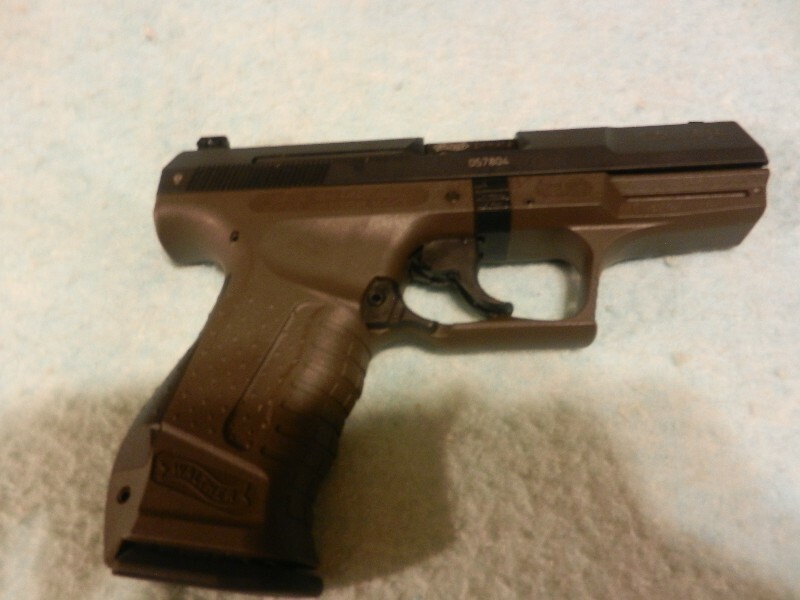 P88 production ended in 1994, and not much was heard from Walther GMBH until 1996, when the polymer framed P99 was unveiled. Development began on the new P99 in 1994, but much was kept quiet and not much marketing appeared prior to the new gun's release. The technical design team for the P99 was lead by Horst Wesp of Glock fame. As a result, the P99 does share some similarities with the earlier Glock. It uses the same modified Browning style of short recoil system with one massive lug which engages the slide. It has a steel slide and polymer frame reinforced with steel, like the Glock. The trigger however is quite different. The P99 was originally released with a striker firing system with a trigger which simulates Double and Single action modes, as if using a hammer fired pistol. In addition, the pistol featured a slide mounted decocking button; not lever. The frame was designed from the outset to be as ergonomic as possible. As a result, Cesare Morini was hired to contour the grip and frame. Morini became famous for designing Olympic class target handgun grips, so it is no surprise that the P99 ended up with one of the most comfortable grips found on a polymer framed handgun. The grip features finger grooves and various texture patterns. It was also the first of its kind to have interchangeable back straps, so its size could be adjusted to fit most hands. Of course this feature is copied by everyone today, but back in the late '90s, it was unique among polymer guns. The pistol came with a proprietary 'closed' rail in the front under the barrel. Again, remember this was 1996 and no one had standardized upon a rail system yet. The gun's sights were also adjustable. Rear sights could be adjusted for windage by turning a screw. The front sight could be adjusted for elevation by replacing it with 1 of 3 sights provided in the box. The magazine was traditional double stack, single feed style with a steel body and polymer floor plate. Walther chose to use metal magazines instead of polymer because it allowed the P99 to have a slimmer grip. Original full capacity magazines held 16 rounds of 9mm NATO (9x19mm Luger/Parabellum). Finally, the P99 had an HK style ambidextrous magazine release located under the trigger as part of the trigger guard. The pistol field stripped by using a modified Glock style takedown lever. I personally find the Walther's lever much easier to use than the one on the Glock. The P99 (Standard) was first offered to the public in 1996 or 1997 (sources are not 100% clear when the pistol was first commercially available). It was imported by Interarms and had just one trigger style and came in black only. It gained a lot of attention from gun reviewers and naturally Walther enthusiasts who had been waiting years for something truly 'new'. The P99 proved to be acceptably accurate, rugged, and very reliable. A couple of years after the introduction of the 9mm version, Walther released the pistol in .40 S&W caliber. This new chambering used the same frame but with a new ejector arm. It also used a new slide and barrel of course; but retained the same recoil spring assembly as the 9mm version. The P99 in .40 has a slightly longer barrel and slide and the slide weighs more. Pistols in this caliber hold up to 12 rounds in standard magazines. Walther also released a version in 9x21mm for markets that do not allow military calibers in civilian hands. In 1999, the P990 was introduced primarily for law enforcement. The P990 is identical to the standard model but instead of having a DA/SA trigger, the P990 has a DAO arrangement and no decocker. The DAO pull on the P990 has the same weight and length of travel as that of the DA pull on the P99. 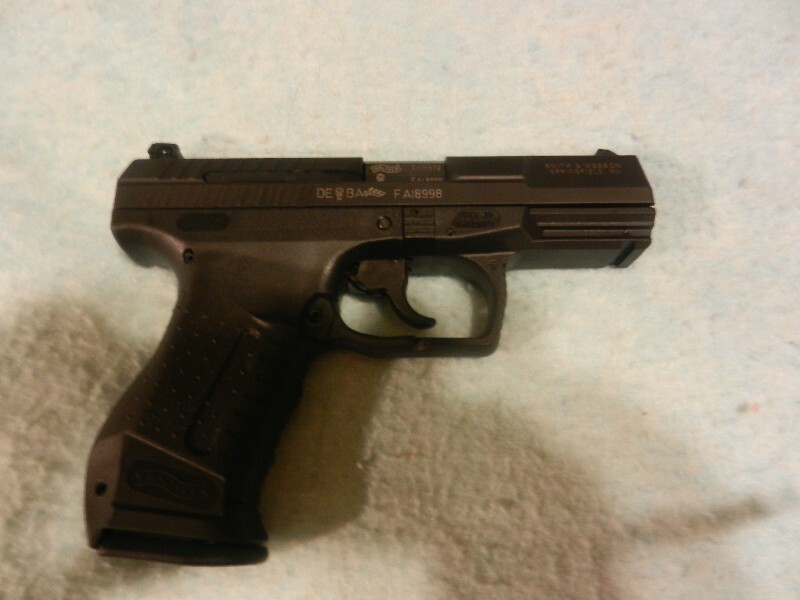 In 2001, Walther introduced another trigger style; the P99QA. The QA or Quick Action trigger is like a Glock's with a partially charged striker. The QA's pull is consistent and somewhere between the long heavy DA pull and the short length SA pull of the standard model. The QA also featured a smaller decocker since it was less important. 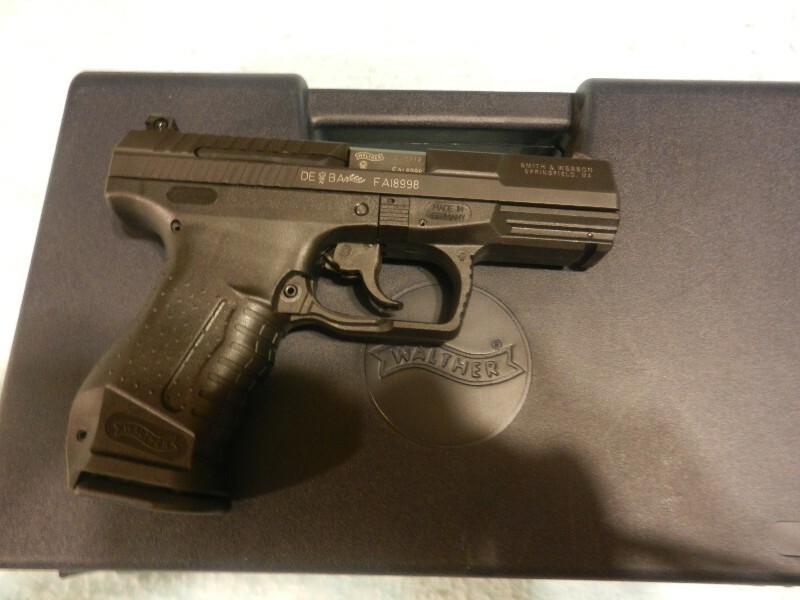 In early 2004, Walther released the P99 Compact or P99c. The compact has a shorter grip, slide, and barrel than the standard full-sized P99. Its magazine in 9mm holds 10 rounds and in .40 S&W; 8 rounds. The P99c is mostly parts compatible with its full-sized counterpart, especially in the trigger system. All three styles of triggers were eventually released for the P99c. Later in the same year, Walther redesigned the entire P99 family. Most of the changes were external; some cosmetic and others functional. The redesigned P99 has become known informally as the Gen 2. The Gen 2 features larger slide grooves set further apart for easier grasping of the slide. The closed proprietary rail was replaced with a standard Weaver type rail to allow a wider range of devices to be attached under the barrel. The trigger guard was also redesigned. It became more rounded overall and the 'skii-hump' was deleted under the trigger. Originally this hump was there to keep the bottom of the trigger at the same distance from the top of the inside of the trigger guard, but enough people disliked it that Walther did away with it. Also the raised shelf below the slide stop was removed though I am not sure why. Walther began offering the P99 with an ambidextrous slide stop/release with this next generation, though it was an option, not a standard. At this time, the P99's magazines were also redesigned. Early magazines held 16 rounds, had viewing holes on both sides, and were smooth metal. The redesigned magazines now hold only 15 rounds but were made more reliable by extending the feed ramp of the barrel and lowering the front lip of the magazine body. Also the viewing holes were relocated to the rear and ridges added to the sides of the new magazines. New generation magazines will function reliably in older guns, however because of the change to the feed ramp, older magazines should not be used in P99s made after 2003. IN 2005, Walther made one more important change to the series. The already ambidextrous magazine release lever was extended. This new release has become standard on all P99s made since. It is also worth noting that with the redesign, Walther took the opportunity to give the various trigger systems clearer model names. The P99 (standard. no suffix) became the P99AS (for Anti-Stress referring to the fact that the first shot in SA could have the same length of pull as the first shot in DA if desired). The P990 was renamed the P99 DAO and the P99QA retained its name. Compact models have the same names, just with a 'c' added such as P99cAS. All P99s with AS or DAO in their model name will be Gen 2 guns, with QAs you will need to check more closely. While researching this writeup a bit I came across an interesting review from the late '90s. In this review, the author mostly praises the P99 but does have this to say about a few areas where it could be improved upon. "....During the development of the P99, Walther is reported to have solicited much input from German as well as other foreign military and police units for guidelines for an ideal 9mm pistol. What someone may have overlooked is that the pistol was going to be heavily marketed in the U.S. where American input might have been of value. For one, I would like to see slide retracting grooves added to the front of the P99's slide, not only for use in cocking the pistol to the single action position, but in order to use the standard underhand manipulation to check the chamber. I would also like to see the retracting grooves wider apart for better purchase. In the age where the value of the upswept "beavertail" design of pistol tangs is well established in getting on the pistol in a hurry, the P99 comes with a tang that's actually reversed to curve downward. Serving no purpose in a self-defense pistol, this tang can only make it more difficult for the pistol's grip to help funnel the web of the hand into position in a high stress situation. Luckily the lubricity of the P99's frame helps overcome this, but the tang would have been better designed with a slight upsweep. If I dry fire the P99 in the double action mode, the left tip of the magazine release bumps the underside of my trigger finger just enough to cause discomfort after only ten pulls. I would file this part slightly to render it level with the inside of the guard. Others who tried this experienced the same "rub." Some have observed that the magazine well mouth is not beveled. While I don't think this is necessary, beveling the front section of the mouth could improve speed reloading. There is plenty of stock there for anyone handy with a file. As it is, the Walther P99 is a superb pistol, and my observations are personal, and of a desire to see the gun brought to its full potential, not only across the sea, but here where a huge market exists for state-of-the-art defensive handguns. I predict the P99 will be one of the great pistol designs of the decade...."
I find it very interesting that really all of Johnston's suggestions to improve the P99 were implemented during the Gen 2 redesign. The extended magazine release takes care of trigger finger discomfort he experienced even. 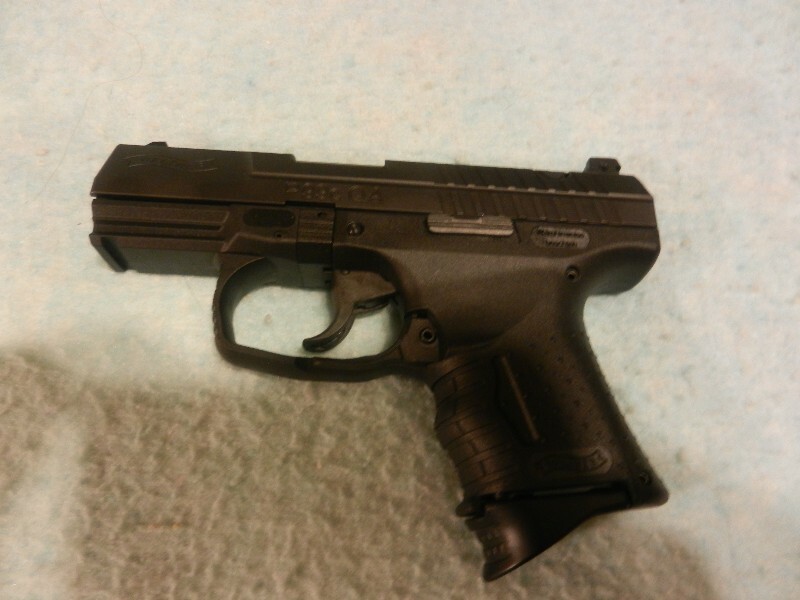 The only suggestion Walther did not take was to give the P99 front slide grooves; however, this feature does appear on the new PPQ model, which was released in 2011 and is based on the P99Rad variant. Oh and the PPQ has a slightly beveled magazine well. 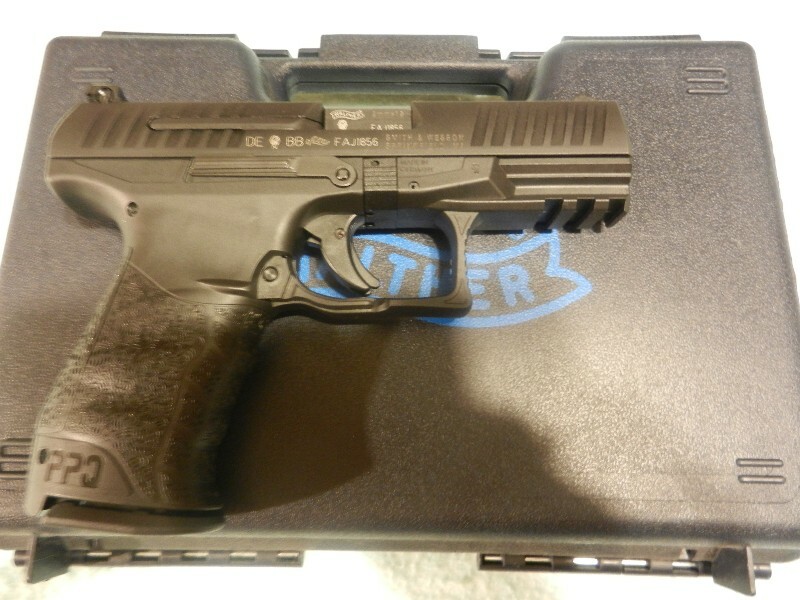 The PPQ is a recent offering by Carl Walther GMBH. It is essentially another redesign of the P99 though. 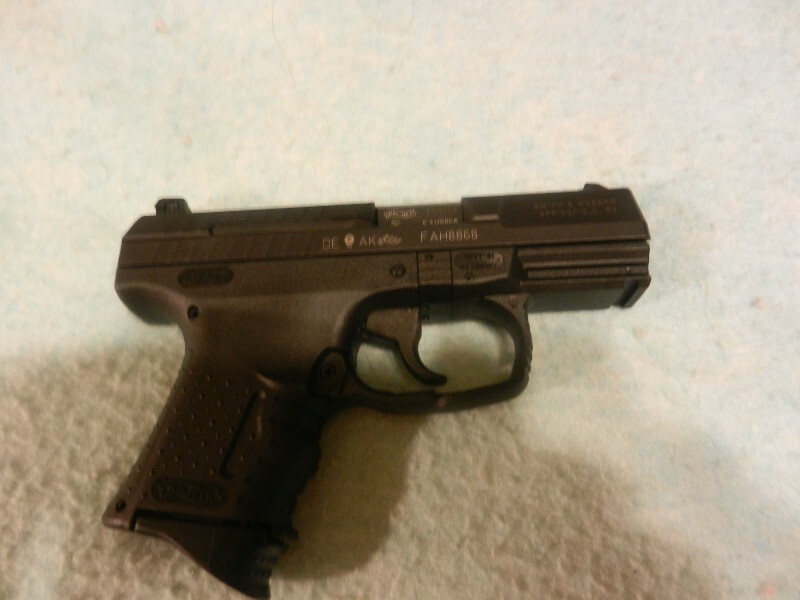 Internally, the PPQ is the same as the P99, except for the trigger system. The PPQ uses what Walther calls the Quick-Defense trigger, which is similar to a Glock trigger but with a very short reset of about 1/10th of an inch and with an average pull weight of around 5lbs. This means also that the PPQ's trigger is a further development of the P99QA's trigger. The PPQ does not have a decocker. The frame has also been reworked with a longer weaver type rail in front. To allow for this new rail, Walther reverted back to a more squared off trigger guard, which permits a bit more room for the rail. The grip was completely redesigned with new finger grooves and a semi-rough texture. The PPQ's grip might look like something an octopus would like to make love to, but in the hand it feels great. It retains the interchangeable back-strap system naturally. 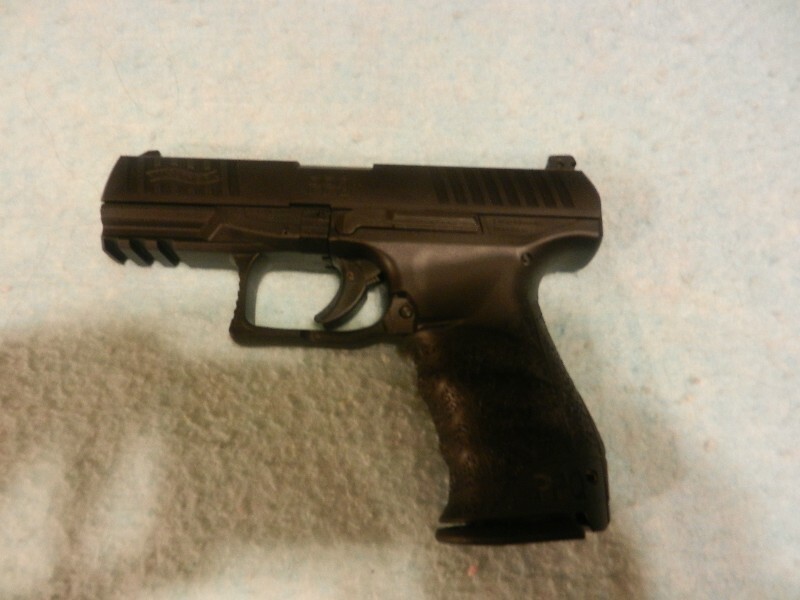 The PPQ has a redesigned slide too with both grasping grooves in the rear and in the front. It comes standard with the ambidextrous slide stop/release lever as well. The PPQ can use any new style of P99 magazine. This new pistol will most likely replace the P99QA in Walther's catalog, though it seems likely that the P99AS will remain in production for the foreseeable future. All P99s are striker fired and use a modified Browning type locked breech system. Basically the end of the barrel where the chamber is located is one massive lug which engages the slide and delays its opening until pressures in the bore have dropped to a safe level. In otherwords, it works like a Glock and most any other modern pistol. The frame is made from an impact resistant polymer reinforced with steel. The slide is made of carbon steel and is coated/treated with tenifer, as is the barrel. Sights are easily removed or adjusted. The P99 requires no tools to be disassembled for cleaning. Magazines have a steel body and spring and a polymer follower and floorplate. All backstraps are made of a soft polymer. The P99 is about the same size as the 'compact' Glock G19 and the P99c is only a tiny bit larger than the Glock g26. 3 sight heights provide range in height from .165 to .200 of an inch, each moving point of impact about five inches in elevation at 25 yards. 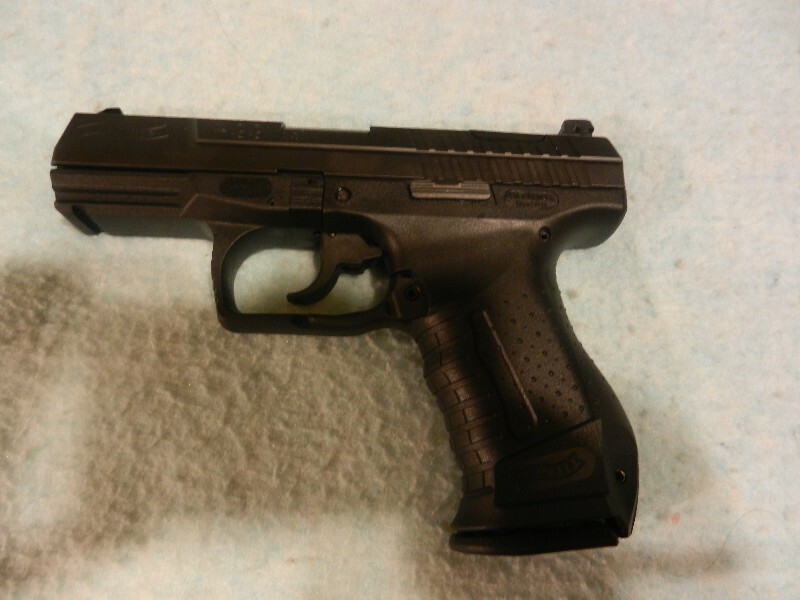 The PPQ retains the same dimensions as the P99 and uses the same sights. Most holsters designed for one will work with the other. The P99 has been produced in several forms, many of which were not widely available. To myself though, most of these variants seem relatively small in that few actual design changes were introduced. MI-6 2nd Edition: again, about 1,000 made with some special paper. Walther and the owners of the James Bond franchise disagreed over this edition so it was never officially marketed though several examples are in the USA somehow. MillenniumEdition: 2,000 made to celebrate the year 2000 with some more special paper and a polished slide. If i sound a bit dismissive of these editions, it is because I am. They are nothing more than normal P99s with a bit of engraving and some paperwork with them. To me they hold little interest. I have never gone in much for special/limited edition guns that are just that because of some minor changes. P99 'split trigger': Early P99s were manufactured with a two piece trigger. This was done so that equal pressure had to be applied to both sides of the trigger in order to fire the weapon. Walther only produced maybe 6,000 pistols with this trigger before transitioning over to the now standard type of solid trigger. As far as I know, all of these were either imported by Interarms or Earl. P99 Military: standard P99 but with an OD Green frame. This was a mass produced item. P99TA: a unique version of the pistol made for police trials in Wurttemberg, Germany. The P99TA featured an ambidextrous slide release which would later be offered on the Gen 2 model, ambidextrous decocker, standard weaver rail, and rounded trigger guard. About 50 of this model were produced. The TA was not adopted by the police, but its design would influence both the P99 Gen2s and the P99Rad. P99QPQ: QPQ stands for Quench, Polish, Quench and results in a matte silver slide which was installed on a black frame. P99QSA: Basically a prototype of what would become the P99QA, but with a standard full-sized decocker button. Seven such guns were created. I believe 3 or 4 are in the USA today. P99 Titanium: a normal P99 but with a titanium coated slide. Note that the slide is still steel under the titanium. 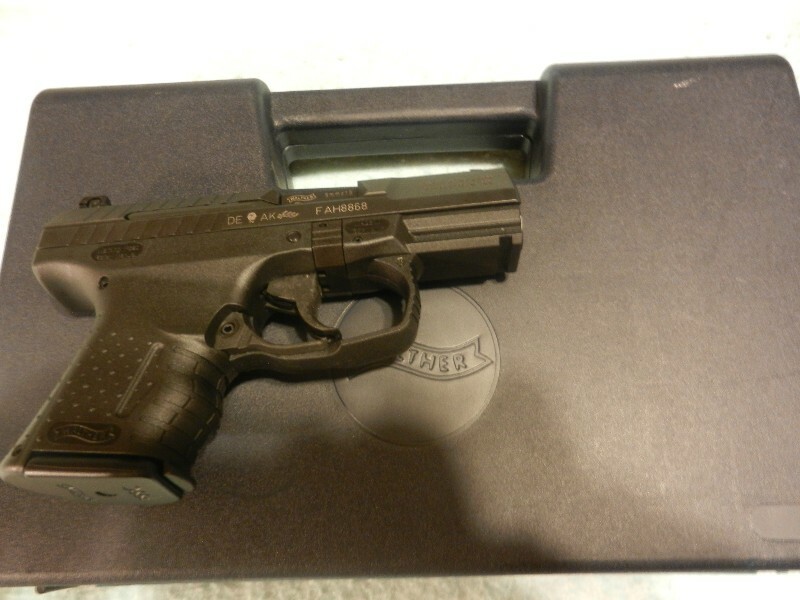 P99 Navy: These pistols were built for Naval trials in Germany around 2005-2006. They are slightly modified P99ASs with stainless steel slides and some other parts. Most had night sights. About 50 were created with about half winding up here in the USA thanks to Earl's Repair Service. P99Rad: a line of pistols produced under license in Poland by Fabryka Broni Radom. The Rad has many features which would later come to the USA market in the form of the PPQ such as the slide with both front and rear grooves, ambidextrous slide release, longer weaver rail, redesigned grip, and extended magazine release. Radom produces the P99Rad with both QA and DAO trigger options. Its not clear if they also produce an Anti-Stress DA/SA version as well. The pistol is used by the German Police in North Rhine-Westphalia and Rhineland-Palatinate and has been ordered by Bremen, Hamburg and Schleswig-Holstein, the Polish Police and the Finnish Army's special forces and military police, where it carries the designation PIST 2003 (Pistooli 2003). Users Canada: SPVM (Montreal Police). Finland: Used by the Finnish Defence Forces as the PIST 2003 (Pistooli 2003). 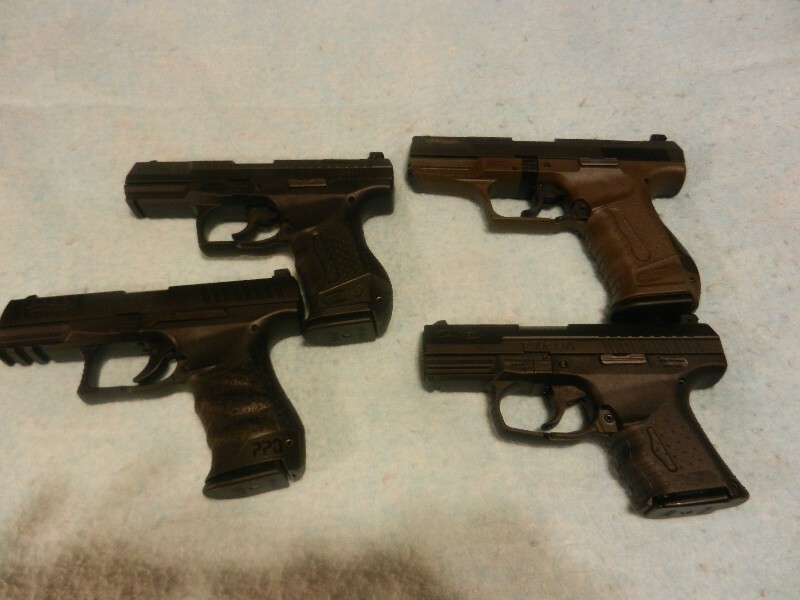 Germany: 41,000 P99DAO pistols purchased in 2005 for the North Rhine-Westphalia Police. The State police of Rhineland-Palatinate procured approx. 10,000 units of the P99Q. The P99Q has also been ordered by the police forces of Hamburg (8,000 pistols), Bremen (2,000 pistols) and Schleswig-Holstein (8,000 pistols) with deliveries between 2009 and 2017. Ireland: An Garda Síochána detective specialist units use the P99C. Malaysia: Royal Malaysia Police (20,000 pistols). I can also add that both Spain and Portugal have purchased notable quantities of the P99. 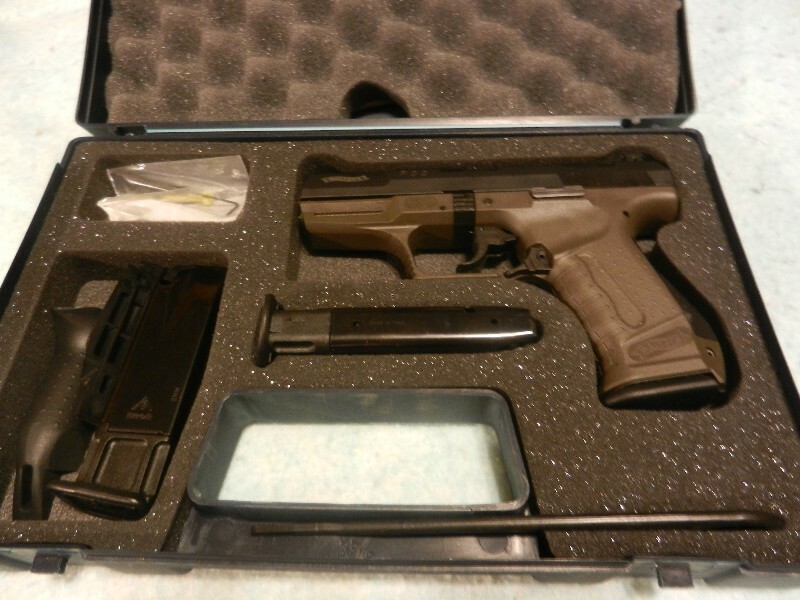 Some police departments in the USA have also authorized the carry of both the SW99 and P99. I have received into my shop several police surplus examples of each. Upon the death of the owner of Interarms, the company dissolved. As a result, no one was importing the P99 for a time. S&W entered into a contract with Walther GMBH to mass import the line some time in 1999. Its also worth noting that Earl of Earl's Repair (CarlWalther US) has also been importing P99s since before the deal between S&W and Walther GMBH. Smith&Wesson marketed a clone of the P99 and of the P99c in the USA for a time. This was known as the SW99 and featured a Walther made frame and an S&W built slide and barrel. The SW99 was cosmetically different from the P99 but used the same magazines. Some confusion has arrisen between the P99 and SW99 because of the Spanish and Portuguese contracts. At that time, Walther in Germany was so back ordered that S&W in the USA did build a few slides and barrels for the P99, to help keep up with demand. These guns are still P99s. SW99s have different contours. Smith&Wesson made about 3,000 barrels and slides for the .40 caliber P99. All 9mms are 100% German and only a small portion of the .40 cals will have S&W parts. The SW99 was chambered in both 9mm and .40 cal like the P99, but was also chambered for .45 ACP. The German P99 was never chambered for this caliber however. Even though the SW99 is now out of production, used examples are easily found and usually at around $300-$400. Many police surplus examples have also hit the market recently, usually in .40 S&W. 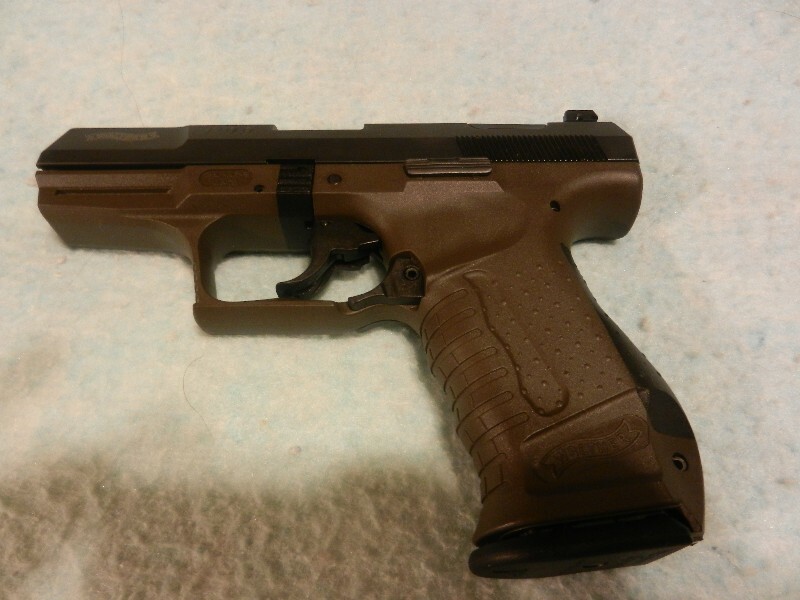 With the introduction of their polymer frame M&P line, S&W discontinued the SW99 series. 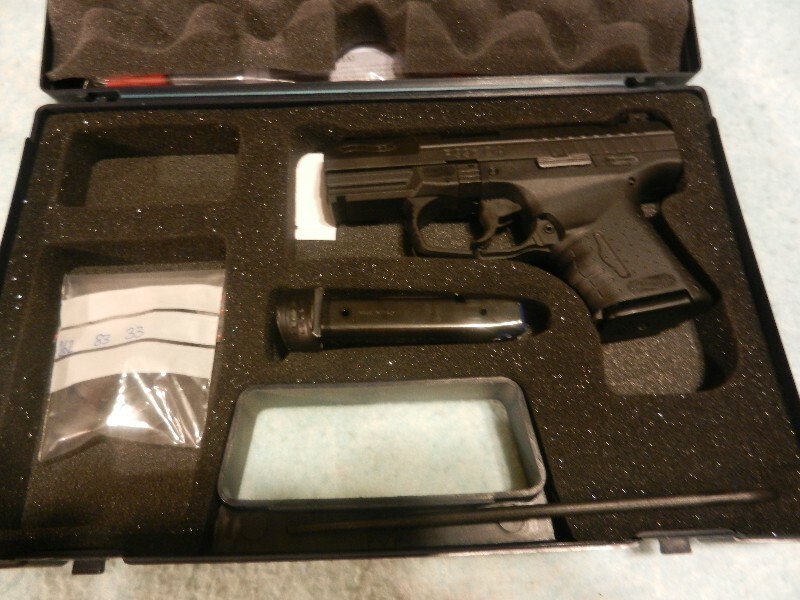 A few years ago, a new company picked up the idea of a half German, half US made P99 clone. Magnum Research has been importing German made frames from Walther and making their own barrels and slides, like S&W before them. The pistol is called the MR9 in 9mm and MR40 in .40 cal. It is mostly a clone of the Gen 2 P99 and even still uses Mecgar built magazines. I have not personally held or fired an MR9, so i can not say much. 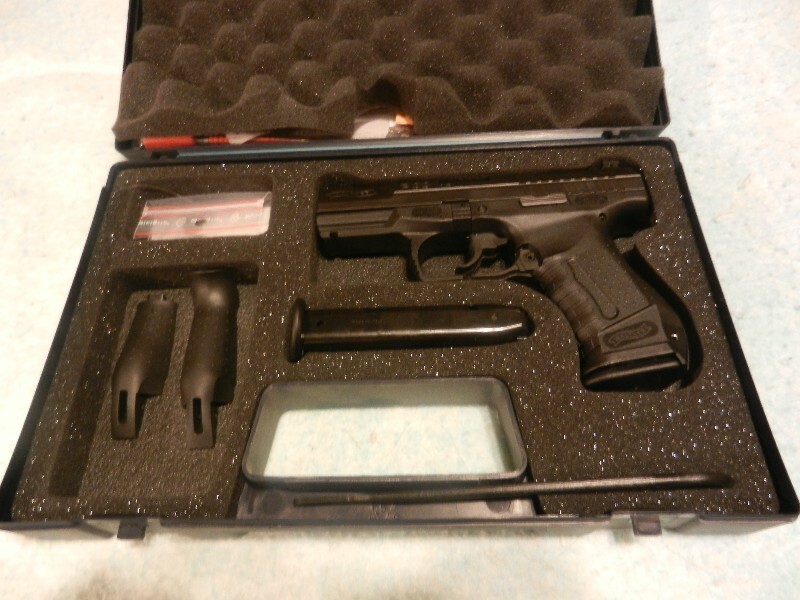 It's probably a decent reliable pistol, but its price tag is only slightly less than that of the P99 or PPQ. 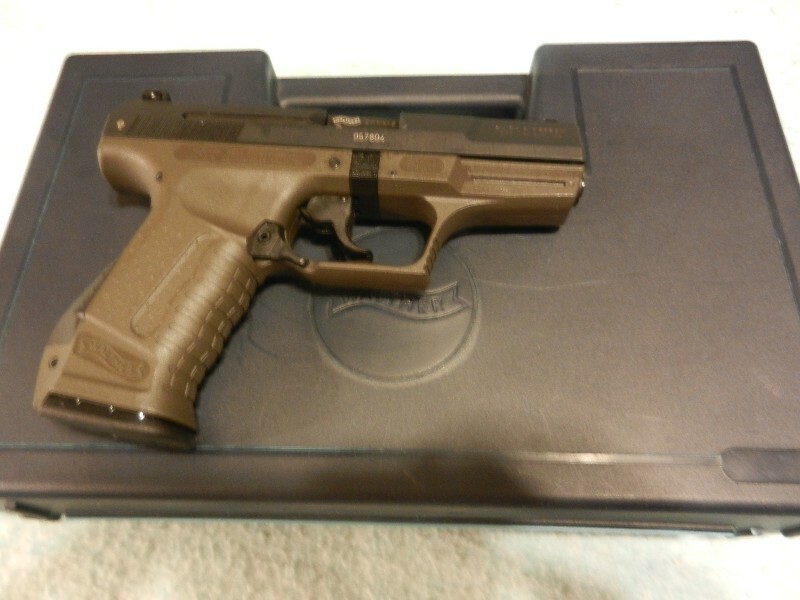 So why not just spend a little more and get a true Walther? At least that's my opinion. I have discovered that MR mags are identical to Gen 2 Walther mags and work great in P99s and SW99s. These mags cost nearly half of what new Walther branded magazines cost too. At least something good has come out of the MR9 venture. As I have said, the first generation of magazines had smooth sides and viewing holes on both the left and right. In 9mm they held 16 rds and 12 in .40. 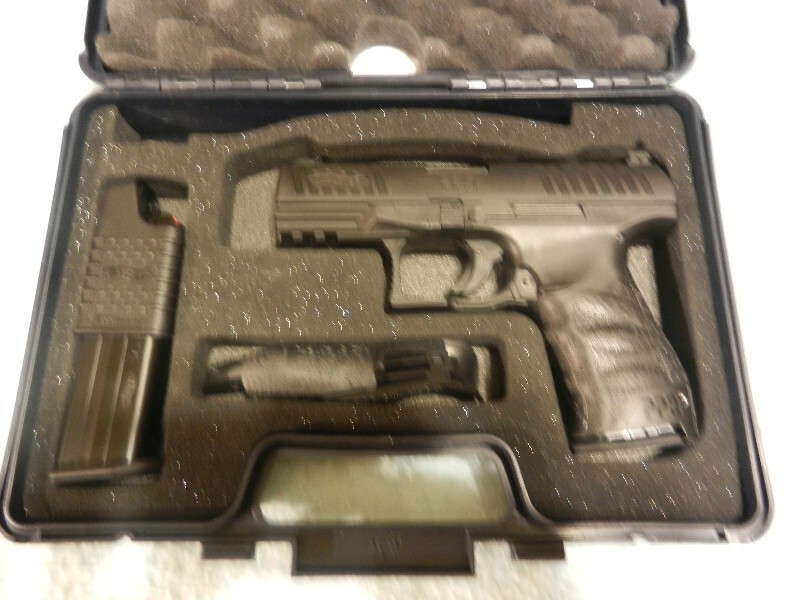 To comply with the AWB, Walther shipped the P99 with reduced capacity 10 round magazines as you can see. Interestingly, the P99 Compact seems to use the same magazine body as the AWB 10 first generation, but with a different floorplate. The Gen2 magazine has ridges running vertically on its sides and the viewing holes relocated to the back. In 9mm Gen2 mags hold 15 rounds and 11 in .40 cal. 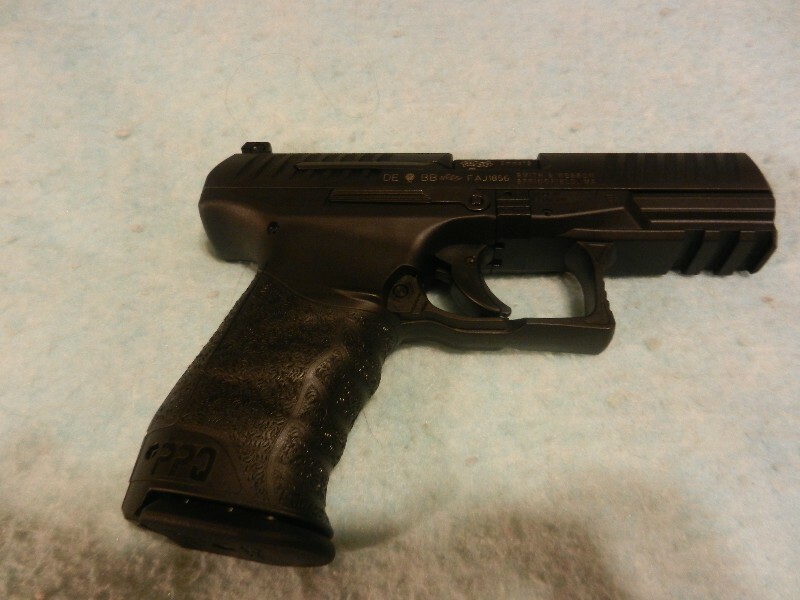 The PPQ magazine looks identical to the Gen2 mag, but has a different finish. 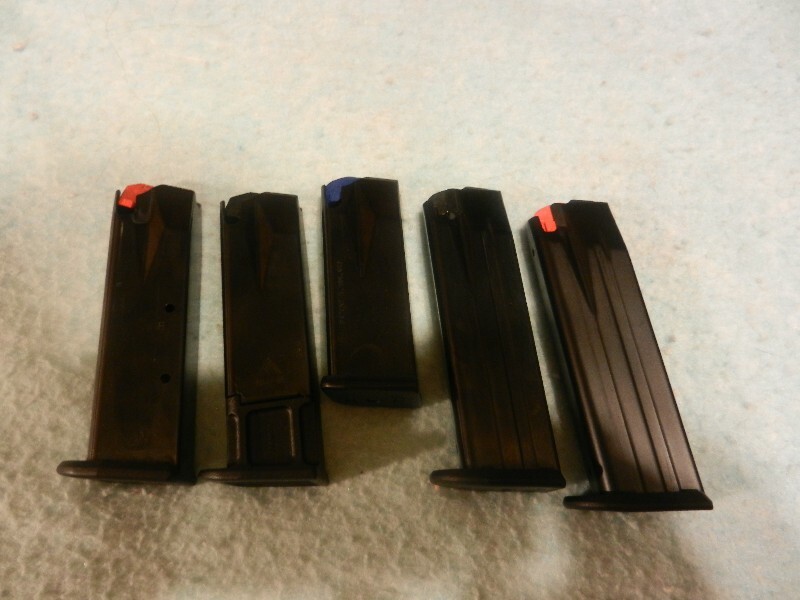 Gen2 mags have a polished blued finish and PPQ mags have a matte black finish. Early PPQs shipped with magazines labelled P99, but they were soon changed to say PPQ instead. There will be a 2 digit date code on all P99 and PPQ pistols produced in Germany. On early models this code was located on the frame, but more recent ones will have it stamped into the slide. Its a pretty typical German style with A=0 B=1 C=2 D=3 E=4 F=5 G=6 H=7 I=8 and K=9. Note that J is not used. So a pistol with KI on the frame was made in 1998 or one with AK on the slide was produced in 2009. Plenty of other discussions out there on the P99. Just use Google. Alright, I think that mostly covers the big points. I will add things as they come to me. Really though, more than anything, it would just be nice if more people went out and put a few rounds through a P99 or PPQ. They really do fit the hand well and are very pleasant to fire, especially in 9mm.